Ever since discovering Saboten a few years back, all the tonkatsu places I've eaten at have paled in comparison. Anzu is the first one to give it some competition. I liked it so much that I took my grandma and sister there to lunch a few weeks after my first visit. Anzu offers an array of variations of the tonkatsu (or fried pork cutlet) as well as a few side dishes and desserts. If you've never had tonkatsu, think of it as the japanese cousin to Country Fried Steak, but instead of being breaded and fried in breadcrumbs, it's breaded in panko or japanese breadcrumbs and instead of being topped with gravy, you have a sweet and salty tonkatsu sauce, similar to a Japanese Worcestershire sauce. The space is open and modern, with lots of booth seating as well as a long shared table seating in the center. The menu is in Chinese and Japanese with photos, but they have an English menu upon request. The funny thing is that the English menu only has prices with Chinese characters- but mostly everything is in the NT$200-300 range. (And the characters for 1-3 are easy to spot with 1, 2 or 3 horizontal lines). I think the English menu is still a bit confusing though- with dish names like "Big bowl of deep fried pork loin set" or "Anzu signature specially meal" which don't provide any English descriptions. You can also save a few bucks by order a bento from their to-go only menu (NT$180-250). Their katsu sandwiches are available only to-go. I've always thought about getting one to go, but I'm usually too full after eating. Like Saboten, they give you whole sesame seeds in a ridged bowl and a chubby wooden stick to grind them up by yourself- a Japanese style mortar and pestle, as well the bottles of help yourself tonkatsu sauce and dressings and all you can eat shredded cabbage. You can choose the plain pork loin tonkatsu (as I usually do), or with curry, tea, mushroom soup, grapefruit and grated radish, fried shrimp or croquettes, or even mixed in with eggs in a katsudon. The sets also come with all you can eat miso soup (their soups change every so often) and rice (choice of white or purple). For an additional fee, you can add a drink and dessert to your set. There is the "pork loin" and the "pork fillet"- I feel like the pork loin or "li ji" in Chinese is juicier. The tonkatsu is quite large (noticeably larger than Saboten or other tonkatsu places I've been to), as well as a bit fattier. But just as crispy and just as mouthwatering. I usually don't eat the fat and end up with chunks of fat leftover on my plate. You could always try the pork loin to get a leaner cut. But it won't be as juicy! If you want to try something different, you can get the radish/grapefruit pork loin set to cut the grease of the crispy fried skin. They give you half a grapefruit to squeeze over the grated radish and it provides a citrus touch to the heaviness. Out of the appetizers/side dishes, the one I liked best was the chawamushi or steamed egg. You have to resist to slurp up the creamy, pudding like consistency. I wasn't as enamored with the stewed beef and vegetables and fried chicken. I wished the beef and vegetables were more fork tender. The portions are small, but the prices are around NT$100. All in all, Anzu is a great place to grab lunch or dinner with the family or friends. It's suitable for large groups and has a lot of choices if you don't mind eating something fried or meaty. When you go to the Nanjing location, make sure you find the right entrance. There is another Japanese restaurant on the corner that might be confusing. Kid friendliness: no kids allowed. Ever since Flavors Swedish Restaurant won for "Best Unexpected Find in Taipei" in my reader's poll last year, I moved it up on my to-do list to visit. After all, who would expect to find Swedish food in Taipei? First things first, dessert! If you decide to go, you MUST remember to order the apple cake. It's moist, crumbly, sweet, flaky- just SO good. The picture doesn't do it justice and I would go back to Flavors for the dessert alone. It's more like an apple pie than what I pictured as an apple cake, but either way it was my favorite dish of the night. I've never had Swedish food before (and I don't think Ikea counts). Flavors does have the Swedish meatballs (in a much more home cooked and delicious way), but they also have a full menu with changing appetizers, sous vide meats and seafood main dishes and drinks that reflect the simple, but hearty cuisine. The English and Chinese menu is pretty huge and can be a bit overwhelming. If you choose a main dish, it comes as a set with the soup of the day, bread, salad, apple cake and coffee. There are also a few multi-course set menus to choose from- "Taste of Sweden" (NT$1700) with aquavit (a flavored spirit) and snapas (small shots of snaps), or Chef Ola's "Summer Gourmet Menu" which included 3 appetizers and 2 desserts (NT$1100). We ended up wanting to try as much as we could, so we got the Taste of Sweden (though in retrospect, I would have gotten the regular meatball set since I am not a big alcohol drinker and it would be a price difference of NT$900 or so). The atmosphere is romantic and intimate, with an elegant bistro like quality. They have a no kids policy so that adds to the "romantic dinner out" atmosphere that you can take a date. It's run by a couple who love food so the service is personable although the waiter spoke on the soft side so I didn't get everything he was saying. The starters include the homemade bread which come with an olive tapenade and garlic spread. The bread is doughy and I like the rustic feel of the plating. The lighting was dim with candles, so my camera was having trouble focusing on some pictures. So sorry in advance! The soup of the day was an orange and pumpkin soup had a nice savory and sweet touch. The amuse bouche was swedish caviar on what seemed like a cream cheese mousse and bread. And it came with the frosted flavors aquavit. I'm not crazy about creamy mousses, but I do like caviar! Next was your choice of appetizer- I got the grilled rosemary scallops which again were beautifully presented. They were juicy and wrapped in bacon- who would complain? I probably could have eaten more than three. The 3 x snapas had three different shots with bite sized treats on cool looking forks. Smoked salmon and proscuitto. Imagine serving something like this at your next dinner party. As each dish came, I was looking more and more forward to the main dish. And I wasn't disappointed. The meatballs and new potato with brown sauce and lingonberry jam was awesome. I think I heard the waiter say that the lingonberry jam is brought in by Chef Ola from Sweden. The potatoes were roasted until the skin was crispy and the meatballs were plentiful and browned so they had a crispy and tender combination of textures. I was unsure to dip the meatballs in both of the sauces or in only one, but you end up mixing it all together, sort of like Thanksgiving gravy and cranberry sauce (although I never liked cranberry sauce before) and everything is on the sweet side. I would have loved more potatoes or vegetables. My date got the sous vide venison which I wasn't crazy about. I stuck to my meatballs. And then the 3 x dessert which included tiramisu and although our favorite by far was the apple cake. Next time, I'm going to just get a huge apple cake. Flavors is open for weekday lunch by reservations only, but also offers brunch on the weekends. Flavors won"Best Unexpected Find in Taipei" on my blog's reader's choice poll.. and I have to agree. I don't know if I ever would have tried Swedish food in the states, but I'm glad it's available here. Happy Chinese Valentine's Day! I can never remember when it is every year, but someone somehow reminds me about it. I sometimes get some emails asking for advice for suggestions for very special occasion places and there are definitely a lot of suitable places to woo your date. I'm a dessert girl (if you couldn't tell) and always give a restaurant brownie points if they have a memorable or delicious dessert. So I'm just gonna throw together a little list of places you can see if you can make last minute reservations (if you haven't planned something spectacular or sweet already) for tonight. I love, love, love their souffle- you just have to make sure to order it in advance before you finish your meal so they have time to make it. 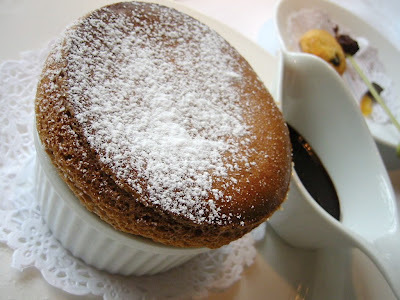 Not too sweet, always fluffy, it will always be the first place I've ever had a souffle. Choose chocolate, vanilla, Grand Marnier or green tea, or get more than one! Their warm lava cake ala mode is also amazing. No kids allowed at this restaurant- so you will definitely have a nice night out without having to deal with food thrown on the floor or seeing other kids running around. The meatballs and new potatoes are fantastic, but their apple cake is like the best apple pie/crumble you will ever eat. A recent find- this place is a steal at lunchtime for NT$400 for a full rustic French lunch set including full sized desserts. It's hard to choose between warm chocolate cake, apple tart, meringue or creme brulee, but you know what my pick is! The lamb shank and duck confit and sauces will blow you away. You don't have to spend a lot to get something memorable- pick up a freshly made mille-feuille to-go for something different. Best eaten chilled, so deliver it to them right away, or keep it in the fridge for an after dinner surprise. This place is desserts and coffee/tea only, so come after lunch or dinner. Splurge on some surf and turf and foie gras, but save room at the end of your meal with Ben Teppanyaki's warm chocolate cake. Feeling something other than chocolate? Then try the Lemon Passion at Macaroni Grill which is ultra-moist because it's soaked in a sweet cream and then topped in a lemon mousse. It helped when I was craving Lemon Meringue and needed something different. Of course you can order any of their other super sized desserts- tiramisu, cheesecake, chocolate cake or apple crisp. Okay, so Tai Yi isn't quite a romantic hang out (maybe the opposite), but it's so hot and humid outside, the thought that someone would bring shaved ice to me so that I didn't have to sweat it outside myself is pretty noble. Who wouldn't want some shaved ice relief? One of the pleasures of living in Taipei is the ability to get shaved ice almost everywhere (thanks to Meet Fresh), but I still think Tai Yi is the best! My favorite combo is the red bean and rice ball with condensed milk. Go for dessert or take home a few scoops, Big Tom has lots and lots of flavors without being too sweet. Plus their waffle is delicious- crispy on the outside, soft on the outside, without being too cake-like. My favorite flavor is peanut butter. I overindulged in the cupcake craze back in LA (Sprinkles, Auntie Em's, Yummy Cupcakes, Crumbs), but somehow it hasn't hit Taipei yet. But you can still get American style cupcakes at Ginjer - my favorites are the ones with cream cheese or chocolate frosting. Pick up a few or plan ahead next time and get custom order designs. Pay the price that you normally wouldn't for the apple tart, strawberry napoleon or macarons. They also have a full menu now with crepes, sandwiches, omelettes and eggs, so you can also eat before you indulge in your desserts. So some quick suggestions from the top of my head. Of course, we don't have to have a fancy dinner or dessert. No matter what, just take a few minutes today to express your love with some hugs and kisses. I always loved getting handwritten cards. But something sweet to make the endorphins rush and the heart beat a little faster never hurts. I know I haven't eaten everywhere in Taipei! 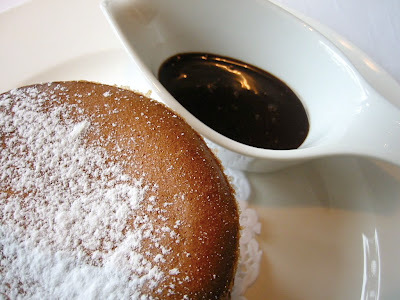 What are your favorite desserts or romantic spots? So I'm back in Taipei, slowly adjusting to the time difference, the humidity/heat and the lifestyle. The first day back, it was sort of surreal walking around Vieshow again and I was sort of in a daze having landed at 5 am and slept most of the day. The crush of people, everyone speaking in Chinese, the relief of stepping inside an air conditioned space. I wonder why it's different this time around- it's not like I haven't gone away for a month or more before. But I'm so exhausted this time around, going to bed at 10pm, up at 4-5am. Maybe because I didn't sleep well on the flight, or the few nights before leaving LA. Maybe because of the heat. Maybe I'm getting old. Haha. Hopefully it will just take the usual week to adjust back. Well, just wanted to let you know the blog will soon be back to its regular programming (Taipei eats!) though I still do have a lot of LA eats that I'd like to mention. It was a great trip- a couple weddings, a few birthdays/anniversary parties, lots of catch ups with friends, new restaurants to eat at, some home cooking and baking, a little shopping and even made it to the beach. Easing back to life in Taipei, so hopefully I can refocus my brain to the stuff that I enjoyed before I left and can't wait to share with you. Somehow I just couldn't write about it when the tastes of LA/OC/SD were fresh on my mind when I was away. Any new must eats in Taipei pop up while I was gone? "I'm an animal. I'm an animal. I'm an a-a-a-a-a-a-a-animal." The lyrics to Far East Movement's "Animal" echo in my mind when I'm thinking about what to say about the restaurant Animal. I'd been reading and hearing about Animal for months and after taking an informal poll on Facebook, I decided I had to try it for myself. Animal's menu changes daily and features all sorts of (ahem) animal parts- from the unusual (pig's ears and chicken liver toast) to fusion (kimchi pork belly or scallops with black eyed peas). I made reservations for dinner a few days before and chose an early 6:30pm dinner over 7:40pm. When we arrived, I was pleasantly surprised to find the restaurant not packed. More elbow room for all the dishes we were going to order. The waiter we got was exceptionally friendly and enthusiastic- happily making suggestions and answering questions and checking in on our table, without being over the top or fake. It might be some of the memorable and best service I've had in LA. I hate it when I ask the waiter to recommend something and they say something like "Depends on what you like" or "Everything is good." Obviously, if I knew that, I wouldn't ask. But our waiter was helpful and steered us in the right direction. We ended up getting mostly appetizers and one main dish and sharing. The more people you come with, the more you can order to share. Unless you can eat a lot like me and my very good friend. I appreciated that the waiter did a great job pairing the appetizers that we chose and spacing them out so we could enjoy the dishes, rather than crowding up the table with everything we ordered like some restaurants do. The first two dishes were two dishes I heard a lot about and deservedly so- the pork belly with kimchi, peanuts, chili soy, scallion (US$12) and the melted petite basque, chorizo and garlic bread(US$11). While I think you could do practically anything with pork belly and it would be delicious (think of the Taiwanese gua bao), I loved how the outside of the meat was crispy and crackly and then the inside fatty pork melts in your mouth. The toasty garlic bread was perfect for dipping in the cheese, but the chorizo got a little lost in all the gooeyness. Round one winner: kimchi pork belly! I don't know what the look was like on my face when the second round of appetizers came out, but I was amazed that the foie gras was so huge! We decided after asking the waiter to get the foie gras appetizer over the main dish (foie gras loco moco) since he said that there was a lot going on the main (hamburger, egg, spam, rice, sauce) which some foie gras lovers felt that the foie gras flavor got lost in it. And I think it was a good choice. 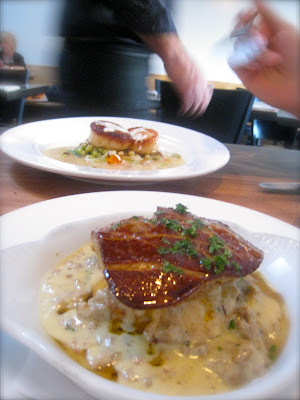 I've definitely never had foie gras over a country style biscuit and maple sausage gravy,(US$22) but it worked. Kind of like having fried chicken and waffles, I suppose. The sweet mixing with the salty with the fat and the starch. Just enjoy the dish and don't try to think about it too much! The scallops (US$12) were perfectly seared and I think it was my first time having black eyed peas, sort of a cross between lima beans and edamame. Round two: very very close, but winner is foie gras. Next was the huge rack of balsamic pork ribs, blistered corn and zucchini (US$37). I don't know if I was still trying to savor the taste of foie gras and scallops, but the pork ribs just didn't do it for me. They were tender and sauced up, but I only wanted to eat a couple ribs. The corn and zucchini were great though- sweet and fresh- tasting like they were dressed in a heap of butter. And like true animals, we gnawed and chewed the meat away until only the bones were left. For dessert, one of their most popular and unusual selection is chocolate covered bacon. But having just sampled it and fulfilled our curiosity at the OC County Fair, we decided to stick to something lighter and get the tres leches cake with dulce de leche sauce (US$7). 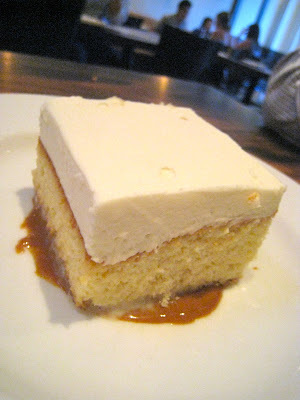 Like a spongecake soaked in milk, the tres leches was sweet, but not overwhelmingly so. It was a nice end to a memorable meal. As we walked out of Animal, the twilight sky was a perfect indigo with clouds adrift. I thought about how amazing it was that we had things like food blogs and Yelp to help us discover awesome little places like Animal- which I doubt I would have ever visited otherwise- it's in an older neighborhood aways from my house and there isn't even a sign to capture your attention if you happened to drive by. So I'm glad I didn't miss out and maybe this post will help some of you discover a new favorite restaurant.